We estimate that an additional 160,000 people benefited from the medical supplies (equipment/drugs and disposables) we distributed to hospitals and primary health clinics. We are now focusing on helping people recover and rebuild livelihoods that were destroyed or damaged by the conflict. This includes helping small-scale farmers and agricultural producers to rehabilitate their land and irrigation systems to enable them to resume producing food, and supporting women entrepreneurs to enable them to restart their businesses in small-scale production, manufacture and retail. 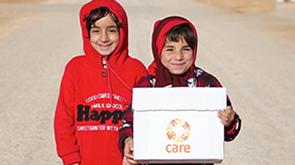 CARE has worked in the West Bank and Gaza since 1948. We work with around 1.5 million people across both the West Bank and Gaza, focusing on economic empowerment (including livelihoods and gender equality), access to health services, clean water and sanitation, and the participation of women and marginalised groups in decision-making at the household, local and national levels. In Gaza, CARE has 12 staff working in five governorates: North Gaza, Gaza city, Deir Al Balah, Khan Younis, and Rafah. CARE’s long-term work with PMRS focuses on increasing women’s participation in improving community health. Ahlam’s story shows that humanitarian aid can be more than a sticking plaster on a gaping wound. Meet some of the mothers and new-born babies CARE has met in Gaza.